I had a very odd experience this week, and it is one that I can't remember having before. Recovering from a shocking act of violence, Cory Chase, classicist and mythographer, decides that taking part in The Papyrus Project, which aims to restore the charred scrolls of Pompeii, might offer her a much needed escape. That is until she suspects that the Modern Pythagoreans, a cult who believe that a lost manuscript of Pythagoras may still exist, are also interested in the scrolls. Now in the early part of the book there is an incident where the main character finds herself in hospital and at one point she is asked to identify herself. "Sophia Anastasia Chase," I told her, surprised my lips could still fit around the syllables. Did you notice anything odd? Hopefully you did! The main character in the book is named Sophie Chase. The main character in the back copy blurb is Cory Chase. Now to be fair there is mention of a Cory in the book, but it seems like a pretty big mistake to make at a publisher. Even more surprising is the fact that two years after being released the incorrect synopsis is still on Amazon.co.uk. There may have been later editions which have the correct details, but I didn't go looking for them. I can't remember seeing such a blatant mistake before, although on Sizzling Sixteen by Janet Evanovich the inside jacket copy refers to an event that doesn't even happen in the book. So this week, I thought I would ask the question "What's the worst mistake you have seen in a book description from a publisher?" This book was the last book left in Carol Goodman's back list. Now I will have to wait patiently for each new book to come out from her, although I did notice on her website that she has released an urban fantasy novel that she has written in conjunction with her husband under the name Lee Carroll. I have no idea if that book will be released here or not, but if I can get it I will give it a go, because I generally enjoy Goodman's writing. 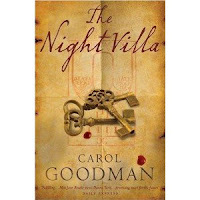 It's probably a good thing that this was the last of Goodman's books that I have read and not the first, because if it had of been the other way around I may not have read anymore from her because The Night Villa is my least favourite Goodman novel. The novel starts with Classics Professor Sophie Chase as she is accompanying one of her students to an interview for a summer internship. Sophie herself had decided not to go on the trip to Italy, but when there is a terrible tragedy, she changes her mind. The aim of the trip is to try and find out more about Villa del Notte (The Night Villa) which was destroyed when Mount Vesuvius erupted in the first century, specifically to try and locate some scrolls which may be previously undiscovered writings of Pythagoras. Threaded throughout the novel there are both the modern narrative focusing on the excavations and other work being done, Sophie's personal history and her connection to members of a Pythagorean cult known as Tetraktyans, as well as a historical narrative which shared a little bit of what it would have been like to be living in the shadows of Mt Vesuvius on that fateful day. The main thing that the team, which is funded by a wealthy benefactor, is looking for are scrolls that may have been written by Pythagoras, which explains why the cult might be interested in obtaining the scrolls by whatever means possible, but other parties also interested also include the Church, and Sophie herself who has previously written about a young slave girl called Iusta who history showed had been the subject of a very unusual court case. I have mentioned before that I find Goodman to be a bit formulaic in that the main female character is usually a widow or divorcee who has an unusual interest or occupation, and who finds herself searching for the truth about events that happened some time ago and as a result finds herself in danger. Whilst some times that formula means that I know what to expect and I can find the reading experience very comfortable, this time that wasn't quite the case for me, as it felt like hard work reading through the novel. Part of the reason for that is that I think that there is an assumed level of knowledge related to the particular themes, this time mythology, and I don't think I knew enough of the mythology to appreciate some of the story. I was very interested in reading this book as soon as I heard what it was about, mainly because I loved the idea of reading a book set in the location near Capri/Naples/Herculaneum, and the location was nearly enough to make the story more palatable, but in many ways the book seemed to still have quite a few unanswered questions by the time we get to the end of the book and the setting wasn't enough to make me turn a blind eye to those flaws. In the end I didn't feel that I could give this book a rating of more than 3/5. So, have you seen many mistakes of the nature I described above? The only mistake on cover copy that I remember at the moment is from a historical fantasy novel about a medieval princess of France, in which she was described as heir to the throne (Fiona Avery's The Crown Rose). Not possible for a woman. I was glad, though, that the mistake was only on the jacket and not in the book itself. One of Roger Zelazny's Amber books has a back blurb that describes the adventures of one character as happening to a completely different character. It's fixed in later editions but I've always kept that old copy because the error amuses me. Sarah, some times I wonder about the people who write the cover copy because it just isn't always 100% right! It's amazing that no one caught that mistake before this book went to press. It's not so much a mistake as it is a spelling error, but here goes. I'm an Egyptologist, and even I remember this wonderful new book that came out some years ago. It was called The Gardens of Egypt. In big letters the book jacket proudly called the book: The Gardens of Egpyt. LOL, that is a funny one Louise! Stephanie, I find it amazing too! WOW...that is a pretty big error; shame on the editor. I loved the cover on the US edition of this one, but I never read the book as no one raved about it. The reviews just were not that good sadly. Bibliophile, I have enjoyed other books from this author, just not this one as much. How weird that they made such a mistake with the book jacket!! This is the first time I have ever heard of this happening, but I can imagine that it's not the first time something like this has happened. I am sorry that the book wasn't as great as you had been expecting it to be. Zibilee, it does seem like a very unusual mistake to slip through, but also to have it still sitting on Amazon UK seems unbelievable to me.